On the surface an entry-level job at a major retailer may appear to be a dead end, but many offer a path to managerial or higher positions. NEW YORK (MainStreet) — An entry-level job at a big-box retailer or fast-food chain does not necessarily equate to being stuck in a dead end job. The not-so-hidden secret of companies like Walmart, Gap, McDonald's and Best Buy is most have a robust program designed to promote from within and help newcomers build a well-paying career. That does not mean that every French-fry maker or shelf-stocker will end up as a supervisor or store manager, but for those willing to try the opportunity is available. Possibly the best example is Walmart CEO Douglas McMillon, who started out as an hourly wage earner loading trucks at a company distribution center. "Walmart is a meritocracy, which means you can go as far as your hard work and talents will take you," said Kory Lundberg, Walmart spokesman, adding the president of the chain's Small Formats division and the president of Walmart East also started out as hourly workers. "Associates who ask questions, focus on the customers and work hard will very often find a rewarding work experience at Walmart." This is particularly useful information for people looking for a stable job in an economy that is still seeing an overall decrease in manufacturing jobs. Gap Inc., owner of Old Navy and Banana Republic, has an entire education program in place to develop store-level workers. The opportunities include the Field Apprentice Program, where field staffers are brought into the corporate headquarters for five-week summer assignments, and Gap Retail Academy, which has e-learning, self-studies, classroom sessions, rotational training, business simulations and multi-media presentations. "Our approach to career development is based on a 70-20-10 model: employees gain 70% of their learning and development through on-the-job experience, 20% through mentorships and collaboration, and 10% through courses and formal training," the company stated. The National Retail Federation (NRF) also countered the idea that store-level pay does not compare well to other fields and while not as high as in the manufacturing sector, retail is growing while factory jobs are declining in the United States. "Looking forward, the Bureau of Labor Statistics is projecting the retail sector to see some of the largest and fastest economic increases in both employment and output between 2012 and 2022," wrote Jack Kleinhenz, the NRF's chief economist. Walmart cited that 170,000 workers were promoted last year, with 40% of those people being with the company for less than a year. 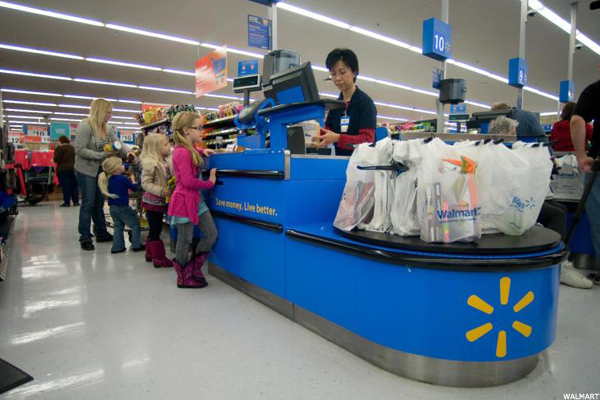 Overall, Walmart employs about 1.3 million people in the United States. The NRF also pointed to a study by the University of Georgia that people who decide to make a career in retail can do well. "A career path from hourly associate to manager or even to CEO is not rare in the retail industry," the report said. "People who make careers in retail, who are stable, reliable employees are generally promoted quite rapidly and see their wages rise through the course of their careers." The study included a look at 13 retail sectors that have stable employees with average monthly earnings of $2,582 per month ($30,984 per year) while the 34 non-retail industries have average monthly earnings for their stable employees of $2,667 per month ($32,004 per year). The retail figure is slightly downwardly skewed, because it also includes part-time workers who tend to make less than their full-time counterparts. At Walmart, about 75% of the store management teams started as hourly associates, said Lundberg, adding that store management teams earn between $50,000 and $170,000.